Frederick James Norris was born in Yeovil in 1890, the son of Brewer's Drayman Henry James Norris (1853-1907) and Sarah Ann née Burch (b1853). In the 1891 census Henry and Sarah were living in Sparrow Lane (today's Sparrow Road) with their four sons; Alfred (b1875), Herbert (b1883), Sidney (b1886) and one-year old Frederick. By 1901 the family had moved to 1 Park Way and Henry was working as a Groom and Store Keeper. Also living with them was their eldest son Frank, a discharged soldier, and seven-year old daughter May. Frederick enlisted in the Army Reserve on 10 December 1915. 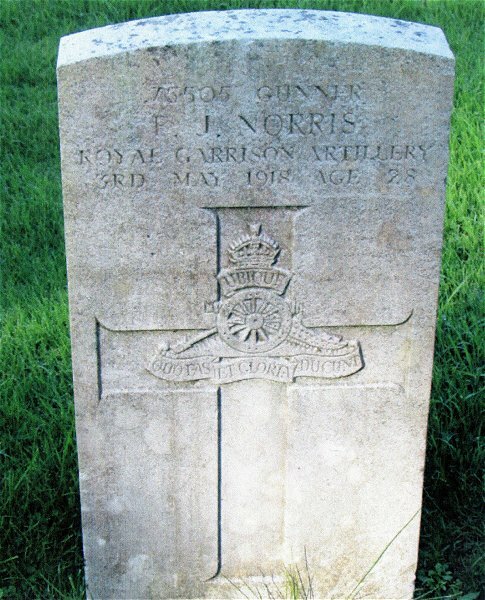 He was a Gunner in the Royal Garrison Artillery (Service No 75505). 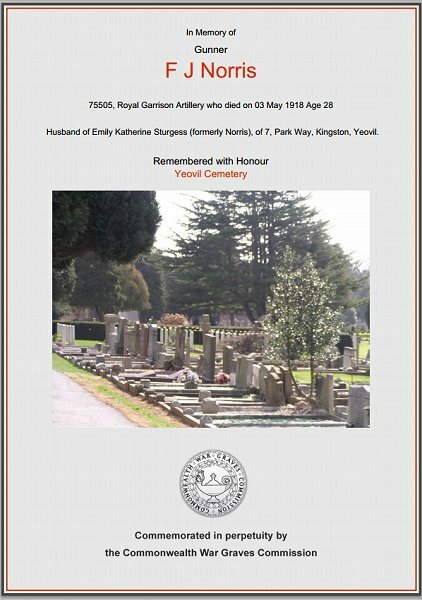 He was mobilised on 11 April 1916. The Royal Garrison Artillery (RGA) was an arm of the Royal Artillery that was originally tasked with manning the guns of the British Empire's forts and fortresses, including coastal artillery batteries, the heavy gun batteries attached to each infantry division, and the guns of the siege artillery. The RGA grew into a very large component of the British forces on the battlefield, being armed with heavy, large-calibre guns and howitzers that were positioned some way behind the front line and had immense destructive power. On the day he was mobilised in April 1916 Frederick was posted to RGA Ceylon (today's Sri Lanka), arriving on 15 August 1916. He served with 93 Company of the RGA in Colombo, the capital of the Crown Colony of British Ceylon (it lost its status as the capital of Sri Lanka in 1980). Typically a company of the RGA was commanded by a major with around six officers, ten NCOs and between 100 and 200 men. The uniform of Garrison Artillery was the same as Field Artillery except that they were more likely to wear trousers instead of boots and breeches. On their shoulder straps were the initials of the name of their Division and the number of their company. Unfortunately Frederick, from about May 1917, began losing weight and complained of feeling ill. He was admitted to the Military Hospital in Colombo where it was determined that he was suffering from Pulmonary Tuberculosis, contracted on active service. He was sent to a sanatorium before being transferred to No 14 Company at Shoeburyness as part of Eastern Coast Defences as a method of getting him back to England. Frederick was discharged due to his medical condition on 12 November 1917. Frederick died at the age of 28, in England, on 3 May 1918 and was buried in Yeovil Cemetery, Grave B943. His name is recorded on the War Memorial in the Borough. The Commonwealth War Graves Commission certificate in memory of Frederick Norris. Frederick Norris' headstone in Yeovil Cemetery.